Two common questions that I (and many others) often get are “How can you predict anything about the state of the atmosphere 100 years from now when you can’t predict the weather 10 days in advance?” and “How do you know that the climate system isn’t far more complicated than you realize or can possibly model?” I often start my answer in both cases with the title of this post. It may sound like I am being facetious, but I’m not; the fact that summer is warmer than winter is an excellent starting point when addressing both of these questions. I don’t think that we have to spend much time on the first question here. We all successfully and continually predict the state of the atmosphere several months in advance whenever we plan our summer or winter vacations. Of course, the seasonal cycle is forced; no one can predict the chaotic day-to-day weather months in advance. More reasonably, we do try to predict whether the temperature averaged over the next summer will be warmer or colder than average in some region, part of the challenge we call seasonal forecasting. Analogously, when we talk about predicting the trend in the climate over the next 100 years due to a projected increase in carbon dioxide, we are talking about a forced response, fully analogous to predicting the extent to which summer is different from winter on average. The forcing in this case is through a reduction in the outgoing infrared flux rather than a redistribution of the solar flux, so the details are different. And the time scales are different. And — the biggest difference of all , of course– we have experienced a lot of seasonal cycles and don’t have to rely on theories/models to tell us what the forced response is going to be. But just because we have a lot more observational input into one problem than the other does not change the fact that the two physical problems are very closely analogous. The analogy to seasonal forecasting, whether next summer will be warmer or wetter than average, is the challenge of predicting the decadal-to-multi-decadal internal variability, generated by the oceans, that will modify the emerging forced signal. I grew up in the Twin Cities of St. Paul and Minneapolis, so I found a lot of interest in this elegant little web site (also here). 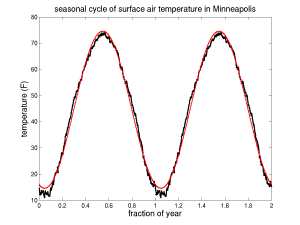 I’ve plotted the seasonal cycle of surface air temperature in Minneapolis in the figure above. The max and min temperatures are averaged together for each day; the individual days are then averaged over 120 years or so. No smoothing is applied. The seasonal cycle appears to be very smooth. In fact, it is almost exactly sinusoidal. (While growing up, I always thought that it was colder than it had any right to be in mid-winter;I can now point to the small mid-winter departure from a pure sine wave as support for this claim.) Despite the potential for complexity (I can assure you that clouds have a very different character in summer and winter in Minneapolis), I think we can agree that this is a pretty simple and intuitive temperature response. Not all seasonal cycles of temperature are this sinusoidal. In the Arctic, for example, the summer gets truncated because temperatures are pegged to freezing and the energy goes into melting ice. Over parts of the oceans with a large seasonal cycle in the depth of the surface well-mixed layer, the warm season is more peaked and the cold season flatter because the heat capacity of the part of the ocean that is tightly coupled to the surface is larger in winter. More counter-intuitive is the spatial structure of the phase of the seasonal cycle near the equator in the eastern Pacific (see Horel, 1982). Looking for interesting structure in the seasonal cycle can be fun — see Mapes,et al in prep. Why is the seasonal cycle in Minneapolis temperatures so simple despite the nonlinear chaotic behavior of the weather making up these averages? Is it because the seasonal cycle is so large compared to internal variability, so that it just overpowers any attempt of the internal variability to couple with it and create more counter-intuitive behavior. This sort of thing can happen in periodically forced nonlinear oscillators. Would the seasonal cycle get more complicated if one reduced its amplitude — by decreasing the obliquity of the Earth (the angle between the axis of rotation and the normal to the orbital plane), leveling the playing field between the seasonal cycle and internal modes of variability? I doubt it, primarily because one still would have a lot of separation in frequency between the bulk of the intrinsic variability, with characteristic time scales of days, and the seasonal cycle. (Are there any modeling studies with very small obliquity?) The deep tropics may be a counterexample, involving the interplay between intrinsic ENSO dynamics and the seasonal cycle, in which “Devil’s staircase” type of complexity is a possibility — but even here the system seems too noisy for this kind of complexity to dominate. What kind of internal dynamics might plausibly couple nonlinearly with the response to the anthropogenic carbon pulse? The decadal to multi-decadal variability typically associated with the thermohaline circulation in the Atlantic seems too fast. Even if one had a lower frequency candidate, my impression is that it is a lot harder to generate serious nonlinearity when internal variability interacts with pulse-like, as opposed to periodic, forcing. At the extreme, there is the possibility that the climate system, and climate models, exhibit structural instability — that climate does not vary smoothly as parameters are varied, not just at isolated bifurcations but more generically. See here and here and here for different perspectives on this issue. This is not an easy topic, and one that I have a lot to learn about. But I wouldn’t advise you to cancel your summer vacation plans just yet. Hmm. Eyeballing your graph, the next harmonic looks significant (temperatures are low at the solstices and high at the equinoxes, i.e. something is going on at a frequency of 2/year). Mainly it’s an extra coldness of winter, perhaps due to a stable boundary layer: kind of an opposite counterpoint to the ocean mixed layer mechanism Isaac mentioned. It appears to be typical of a lot of continental areas, browsing reanalysis data. I doubt if it is safe to say anything about the harmonics when only two cycles are shown, but it would be interesting to analyse, say, 50 years. The annual cycle depicted is averaged over more than 100 years. I have just duplicated this average annual cycle twice to make it a little easier to look at. I am sure that the second harmonic is significant. Interesting post. It seem the issue of “tipping points” and their unpredictability seems to be important here. While we generally can say that historically rapidly rising CO2 will lead to higher global temps over the long-term, more importantly it seems is the issue of how we get to those higher temps. We can be assured that it it not a smooth linear process, just as the transition between winter and summer is often not smooth gradually rising temps, as the clash of cold and warm air masses causing last weeks tornado outbreak would attest to. These outbreaks are nearly always a spring phenomenon for this very reason– transition are often violent and sudden. Ice Core data would seem to agree…yes, we will get higher temps with increasing CO2, but those changes will often occur in very rapid “tipping point” jumps. The actual evolution of climate would never be as smooth as the forced response, if only because of superposition of internal variability on top of the forced response, but I wouldn’t call these “tipping points”. When internal variability causes a temporary trend of the same sign as a forced trend, the rapid change can look like something distinctive is happening, but it still could be a relatively linear superposition. On the other hand, I certainly don’t want to give the impression that there is no room for surprises as the climate adjusts to a warmer state. I find papers on the chaotic underpinnings of weather/climate patterns interesting, which is to damn them with faint praise. I do really wonder where they get us beyond explaining some small but discernible spectral excesses and then really only in the ENSO case. There are some investigative papers looking for breaks between regimes in the historic thermometer record but I find some to be more like fishing exercises. I know that there has been some work with re-modelling (I think the US mid holocene?) informed by the acquisition of paleo-data that can show some effects but I think they have to be teased out. There are papers written from deep theory but where are the dead bodies in the real world. When I went to school, climate was taught as part of geography. A state of affairs determined by the disposition of terrain, water, and celestial mechanics. In England we enjoy a lot of weather, we are ideally positioned to experience maritime, continental, arctic and subtropical air flows. I also know that in many lands there is comparatively little weather variability or holiday weather. I am not sure the irreducible uncertainty is all that it’s cracked up to be if we are discussing sensitivities. In experimental terms, the vaguely exponential growth in forcings is precisely what I would not wish for, it is self-same, an eigenfunction of any linear time invariant system, that maps to its response by a scaling and a temporal lag. This is an evidential problem, uncertainties in the forcings give uncertainties in the empirical sensitivities. I believe that this has historically extended to the models for which freedom to select forcings may have allowed for the known spread in modelled sensitivities. So I do not see that we are necessarily close to uncertainty’s irreducible limit in this respect. Here are some sine fitting plots I created from ARGO data. The signal at 45ºS looks good to 1000M depth. Hi Issac – I have posted on my weblog regarding your “Summer is warmer than winter” post. I look forward to a constructive discussion on our disagreement on this science issue. My post is accessible at https://pielkeclimatesci.wordpress.com/2011/06/01/a-different-interpretation-of-issac-helds-view-of-forced-climate-change/. Roger: I prefer to call my anticipation that next summer will be warmer than the past winter a “prediction” (a very high confidence one, admittedly) and you don’t, and we could discuss this semantic point. But I think the substantive issue that we disagree on is simply the magnitude of the forced response to an increase in CO2 as compared to internal variability. If this signal/noise ratio is too small, than predicting climate anomalies a century from now will be analogous to the prediction of departures from the climatological seasonal cycle (for example, the phase of ENSO) many seasons in advance — and extremely difficult if not impossible due to the underlying chaos in the system. If this signal/noise ratio is large enough, as I am confident it is (I hope to explain my own personal basis for this confidence as these posts evolve) then predicting climate anomalies a century from now, given plausible CO2 trajectories, becomes possible. Almost all of the complexity of the atmosphere, including that inherent in the hydrological cycle and clouds that you mention, comes into play on the seasonal scale without making the seasonal cycle hopelessly complex. I find this encouraging. I’m aware of that it’s wildely presumptious of me to meddle in a discussion on this level, but anyhow, here I go. I’ve been thinking about Roger’s answer to Isaac’s question on the existence and nature of internal variation in climate models. This seems to me to be an important question in the subject. I’ll first try to reformulate the answer, as a check on that I have understood it. We build on work done by Lorentz. He considers a time-dependent dynamical system. The time dependence of this equation varies cyclically, where the periodically varying equations model the variations of seasons. We also consider two related three-dimensional dynamical systems, the first modelling a state of Constant Summer and the second modelling a state of Constant Winter. Both these systems have special features. The special feature of the Constant Winter is that there occurs a reduction of dimension of the dynamical system. There is a “strange attractor” present, so that the dynamical system will tend towards a certain subspace of three-dimensional space. The precise geometry of this attractor is very complicated. In the paper by Lorentz’, it’s only discussed from an experimental point of view. Anyhow, it seems likely that the dynamical system induced on the strange attractor is chaotic and transitive. In the Constant Summer system, there are two distinct attractors A and B. That means that during Constant Summer there are two distinct states, but in Constant Winter there is only one. In summer, the “climate” will settle either at attractor A or at attractor B. The system cannot jump between these two states during Constant Summer. Now we go back back to the original, time dependent system. At least intuitively, the dynamical system will vary periodically between the two extremes of Constant Summer and Constant Winter. During a given summer, the system will be in either state A or state B. While the summer lasts, it cannot go from one of the states to the other. But in this system it possible to jump from the “climate” of A-summer to the “climate” of B-summer, namely during the winter period of the system. Lorentz makes the case that this intuitive description actually corresponds to the behaviour of the system. He makes the case that the system will expirience a random sequence of A-summers and B-summers. The paper of Pielke and Zeng studies the behaviour of this model over a considerably longer time period. They also compare the long term statistical behaviour of the time-dependent model with the behaviour of the Constant Winter model. The upshot of this is that they find that the long term variation is greater in the time-dependent model, so that in this particular model, introducing a high frequency forcing has the effect of introducing variations on much longer time scales. Although they don’t say so explicitly, the long time variation is presumably due to the random shifts between A-summers and B-summers. This finishes my impression of the Lorentz-Pielke-Zeng system. It seems to me that this form of possible internal dynamics is of a quite special type. It presupposes (1) Some sort of slowly varying control variable. In Lorentz’ example it is simply the time t, but I suppose it could as well be an internal variable s(t). (2) Distinct basins, such for some values of s(t) cannot pass from one basin to another. (3) However, when s(t) varies it becomes possible to go from one basin to the other. As s(t) changes again, we might get into the area with distinct basins, and the dynamical system gets trapped into one of these. Now to my questions. (1) Is this supposed to be a typical example of long time variations in a climate model, or are there other possible mechanisms? If there are other possibilities, what would an example be? (2) The mechanism seems to have other distinctive traits, besides the pure existence of internal long time variations. Is it possible to characterize this type of system, and to detect its presence in a given climate model? Issac – Thank you for your reply. ii) these models must also skillfully predict the changes in the statistics of these atmospheric/ocean features due to the added atmospheric concentrations of the greenhouse gases. It is these climate circulations that have the most important influence on societally important events such as drought, floods, tropical cyclone tracks etc. The challenge is that while requirement i) is testable today [and evidence on this would be welcome], but requirement ii) cannot be achieved until several decades from now, unless one can show the effect of added greenhouse gases for the period, for example, form 1979 to the present. I suggest 1979 to the present as the global data quality and coverage became more homogeneous starting in 1979. How do you see testing these requirements? What evidence do you have the requirements i) and ii) have been achieved? Roger — I think it is important to recognize that warming superposed on unchanged variability (ENSO, PDO, cyclone frequency) can be very significant. Think of heat waves — add 3C to summertime temperatures in Chicago and keep the pdf of temperatures fixed — that has consequences. You don’t need to make the case that some model adequately simulates the statistics of heat waves in Chicago. If you can make the case that you have such a model, then you can address the question of how the shape of the pdf might change — that’s great — but even without it, the implications of the conservative assumption of no change in pdf can still be very significant. I would also emphasize that it is important not to lump all phenomena of relevance together and condemn modeling efforts because they cannot do everything. The ability of models to speak to different issues varies a lot across phenomena. I have included a couple of posts on the Atlantic hurricane issue. Post #2 describes the quality of some simulations of hurricane frequency in the post-1980 period. Post #10 then addresses the use of this model to study attribution of current trends and future projections (I think I will have to return to this, since several emails have indicated that I managed to confuse some readers). It think this is a very good case study for discussing how to evaluate a model/theory for use in projections. It’s a process, requiring an understanding of which model deficiencies future projections are most sensitive to, and whether past variability samples the space of possibilities adequately or if new physics comes into play as the climate warms. Issac – We agree on this point – “…. that warming superposed on unchanged variability (ENSO, PDO, cyclone frequency) can be very significant.”. Indeed, we and others have shown that land use change (such as urbanization such as experienced in Chicago and elsewhere) can result in hotter weather even with unchanged large scale variability. Added CO2, while adding to the warming, may actually be a secondary influence as contrasted with this local land use change in this example. Since land use change has occurred over such large areas of the globe, its affect on temperatures can ameliorate or amplify what occurs as a result of other climate forcings. The attribution of temperature changes as a boundary problem is much more complex than relating to just the radiative forcing of added CO2, and other greenhouse gases. The issue that I have concluded is more fundamental, however, is the extent that added greenhouse gases, aerosols, and land use change alter regional and hemispheric circulation features. The question is the extent that these circulation features are altered from what they would be in the absence of these human forcings, as I wrote in my earlier comment. Our paper, however, is only a start at answering this question, as we did not compare the relative role of this human forcing from aerosols with natural variability. To answer the question as to whether or not added greenhouse gases can be treated as a boundary problem cannot be adequately answered until both the role of other human climate forcings and of natural variability are quantitatively evaluated by using real world data in conjunction with the model predictions on multi-decadal time scales. which addresses the extent the IPCC type models have been adequately evaluated as tools to answer the questions such as you and I are discussing. Your comments on that paper in a post on your weblog would be very valuable. I don’t disagree with the argument that forcing with more horizontal structure is more efficient at generating changes in the mean atmospheric circulation than more uniform forcing of the same overall magnitude. I think it is very generally recognized that, for the same global mean forcing, aerosols perturb the mean precipitation field more than do the well-mixed greenhouse gases (WMGGs). So if, up to the present, anthropogenic aerosols and WMGGs have had comparable effects on regional precipitation, say, the WMGG effect will undoubtedly grow and will be essentially irreversible on the time scale of several centuries, in the absence of geoengineering, while the aerosol effect will likely be bounded by its current magnitude, and the WMGGs will dominate. The ozone hole vs WMGG effects on Southern Hemisphere circulation are analogous in this regard. I gather you feel that WMGG effects are so small that they will not dominate over other forcing agents for most phenomena of interest even as concentrations continue to grow over the next century. This is where we part ways if I understand your position correctly. Issac – In terms of very long term effects, the aerosol influence continues even if the emissions were stopped (which is not likely to occur, unfortunately). Nitrogen emissions, as one example, do relatively quickly deposit on the Earth’s surface, but their effect on biogeochemistry of plants and other parts of the biosphere will persist long after the atmospheric concentrations would fall back to more natural levels. With respect to human land management (advertant and inadvertant), land use change will effect climate indefinitely. I agree with you that the effect of added carbon dioxide will also persist indefinitely and it is a significant human climate forcing. I am actually more concerned about its biogeochemical effects than its radiative forcing, but both are important. other human climate forcings are of at least as much importance on the time scale of decades. This broader perspective, including the recognition that natural climate variability is larger than simulated by the global models, makes the climate predicition problem much more difficult than suggested in your analogy to the annual cycle. We are too conservative if the focus is just on CO2 and a few other greenhouse gases as the dominate first order climate forcings. If I am correct, than the proposals to geoengineer away the radiative effect of added greenhouse gases is fraught with risk, as we would be just adding further to the complexity of how humans are altering the climate system. Some climate changes will be dominated by greenhouse gas increases on the time scale of several decades and others will not be due to the higher noise level. Table 11.1 in Ch. 11 of the WG1/AR4 provides estimates of the time it takes 20yr mean seasonal temperature and precipitation changes averaged over various sub-continental regions to emerge from internal variability, according to the CMIP3 ensemble of models (ie, given both their responses and their internal variability). I lean on the models a lot, plus I was one of the Lead Authors for this chapter, so this can be taken as a more explicit statement of my starting point for discussing this issue, at least for this subset of variables. The time required for these 20yr means to emerge from the model’s own noise varies a lot. Temperature responses emerge in most regions after 20 years — 20 year mean precipitation signals emerge in some regions in 30 years, some not for 100 years if then. Evidence that the model responses, or model internal variability levels, are biased one way or the other can then be brought to bear to criticize these numbers (and on a more minor point, one can question how the choice of regions and seasons affects the results) — but it helps to have a clear idea of the model results that one is then arguing should be modified. Issac – Thank you for clearly clarifying our area of disagreement. In my view, the use of the CMIP3 ensemble of models (or other global climate models on this time scale) does not permit the testing of your hypothesis on the dominance of the added greenhouse gas relative to natural variability over multi-decadal time periods. While I agree that models are very valuable tools, they are, however, just hypotheses. They must be tested against real world data. This means, for example, they need to show skill at predicting the statistics of large scale circulation features, and the change in these statistics due to human climate forcing. the models still have a way to go to be accepted as robust predictive tools, in the similar manner as we accept numerical weather prediction model results. Wyatt, Marcia Glaze , Sergey Kravtsov, and Anastasios A. Tsonis, 2011: Atlantic Multidecadal Oscillation and Northern Hemisphere’s climate variability Climate Dynamics: DOI: 10.1007/s00382-011-1071-8. illustrates the type of variability that the global climate models must skillfully simulate. The CMIP3 ensemble of models need to show that they can recreate this observed variability [in fully coupled ocean-atmosphere-land form] given initial conditions for the ocean, atmosphere, and land. Than the next step is to show they can skillfully predict changes in this variability due to added CO2 (and other human climate forcings) over the time period for which we have real world observations. This is, in my view, a necessary condition to accept global climate predictions of regional climate in the coming decades. Model quality is one of the things that I hope to discuss, carefully and critically, on this blog. Hi Isaac – great blog, I’ve enjoyed reading it. Roger, it seems to me that you and Isaac are focusing on different scales. I may misunderstand you, but my reading of your argument is that the CMIP3 projections of regional climate statistics such as ENSO are not worth paying attention to because the models do a poor job of simulating them in the current climate. You also seem to be saying that any future local climate changes may be dominated by regional-scale circulation changes, which do not necessarily scale with global-scale changes, and the models do not necessarily do a good job of simulating. Both of these points seem absolutely valid. However, I do not understand how these points negate the models’ global-scale metrics such as climate sensitivity. My understanding was that modellers actively work to determine whether one can say something significant about the difference (A – B) between scenario A and scenario B, even if neither corresponds particularly well to the real world. I thought this was done by exploring the parameter space, both directly and using emulations of the simulator, to determine the sensitivity of (A – B) across a parameter space that is broad, even if it does not completely cover the real world. Alex – If the models cannot skillfully simulate real world atmospheric/ocean circulation variations on multi-decadal time periods, how can the results of model differences be accepted as robust representation of reality? I am not sure how to interprete what you mean by reality or your expectations of it. There is a narrow meaning which is solely what comes to pass with the unfolding of time. There is also a broader meaning which considers what properties systems have whether specific outcomes occur or not. Perhaps you are using both senses and argue between them as follows: If the models neglect to produce a representation in the narrow sense, can they be representative in the broader sense. I do not mean that the narrow sense is limited to precise reproduction but I do mean that it is limited by the statistical relationships of the events that actually occur. The expectations one may have also vary. They could be the necessity for predictions to have skill in the narrow sense, which is what I think you must mean. They also have a broader sense in which one only expects the effects of the tendencies due to the known factors to be represented. My perspective concentrates on the broader sense, and you might rightly conclude that this does not address the problem, if the problem is couched in the narrow sense. So my task must be justify the use of the broader sense. The usefulness of the simulators in the broad sense depends on the question of the degree that GCMs are climate models. Which may turn on whether they are simulators untainted by emulation. To be a climate model means to model some climate, not necessarily Earths. So my question in the broad sense is the degree to which the simulators model climate as opposed to reproduce a particular historic record. From this broad perspective I have a concern quite opposite to what you seem to have. I worry that the models have been overly constrained to emulate the historic record in terms of the surface temperature at the expense of fidelity to climate modelling. I take the IPCC error bars in the known forcings to heart and also the likelihood of their incompleteness. Given that I have concerns due to how well the models conform to the historic temperature record, particularly the behaviour of the emsemble mean. I would be relaxed if the emsemble mean tracked significantly above or below the record. To be blunt, the accuracy of the match raises the spectre of learned behaviour e.g. emulation. So much for my doubts, they needed stating but now I must rescue my concept of the value of climate modelling. My expectation of climate models is that they should simulate climates and that their response to changes of physical variables may reflect certain inherent climatic tendencies. Some of these tendencies may be robust, in the sense that they are consistent, although not identical, across a broad range of modelled climates and a broad range conflicting alterations of other physical variables. An example of such a tendency would be for increasing WMGHGs make the climate warmer than it would otherwise be even if the conflicting imposed variations were actually resulting in a cooling. I consider the question as to whether my expectation is valid is the same as asking if climate has a significant analytic core, both mathematically in terms of its behaviour in response to its variables and in the general sense of being open to analysis. If the second is false then the whole science is in jeopardy, if the first is false then I have no basis from which to make predictions. Now I have doubts that robustness in the narrow sense is obtainable and hence meaningful. I do think it is meaningful in the broad sense and it is a measure of the degree that tendencies hold even when heavily conflicted; when they occur in modelled climates that cover a broad sweep of the parameter space and necessarily the model space. The model space including the many different ways of embodying the known physical laws into models. I neither expect that you would agree with my expectations nor that I could convince you. I do think I may have restated the two positions in a useful way. My expectation is that simulations will get many things wrong as we know neither the precise values to give to many of the variables nor whether the model is remotely complete. So I must conclude that the search for robustness in the narrow sense may be illusory, for even if we happened upon the perfect model our ignorance of the correct inputs and the true outcome might prevent us from recognising it be so. In turn I accept that robustness in my broad sense is no guarantee of a correspondence to the Earth system. My robustness is a property of the climate modelling, it is a necessary property for a solution to exist. In the absence of a climate theoretic approach I cannot see that we can do more than build models based purely on physical principles and analysis them to see which of their tendencies are robust. Viewed in a negative sense, the identification of tendencies that breakdown outside narrow ranges may inform us as to the limits of prediction. Isaac: The discrepancy of the sine curve and temperature is small in the winter. If you added the annual cycle of solar insolation, you would see expose a much larger “discrepancy” from the simple behavior you illustrate – the phase difference between insolation and temperature. In Minneapolis, this difference appears to be about the 1.5 months response time you discuss for the atmosphere in a more recent post. In coastal California, where I grew up, September is often the second warmest month of the year because the ocean adds so much to the local heat capacity. One might apply the same reasoning to the Arctic and say that the heat capacity in the summer is much higher than in the winter. The difference between transient and equilibrium climate response is also a function of heat capacity. I never meant to imply that the phase of the temperature was identical to the phase of the insolation. You have to at least take into account the atmospheric heat capacity in any simple model of the seasonal cycle of temperature over land, and in most regions the phase of the annual cycle is also affected by the proximity to the oceans, as roughly accounted for by the simple horizontal diffusion model with land/ocean contrast in heat capacity that I referred to in the post. Also, you have to be careful when attributing the difference between transient and equilibrium sensitivity to the oceanic “heat capacity”. Even though the oceanic mixing layer (lets say 50 m deep) has much larger heat capacity than the atmosphere, it is still more or less irrelevant for the difference between equilibrium and transient sensitivity,since we typically define the latter using forcing varying on time scales longer than the equilibration time scale of the mixed layer — as discussed in previous posts.